When it comes to celebrating the New Year it seems that everyone has their own peculiar way of doing things. Some people throw bread, others burn scarecrows, and still others fist fight for good luck. These are some of the strangest New Year’s traditions I have found from researching New Years Eve on the internet, from around the world. In Spain, if you can manage to stuff 12 grapes in your mouth at midnight you’ve achieved good luck for the next year. In the Philippines it’s all about the cash. They believe that everything should be round so as to represent coins and bring wealth. Round food, round clothes, as long as it’s round. In some South American countries wearing coloured underwear will determine your fate for the new year. Red underwear means you’ll find love. Gold means wealth, and white signifies peace. In Japan they ring all of their bells 108 times in alignment with the Buddhist belief that this brings cleanness. It’s also considered good to be smiling going into the New Year as it supposedly brings good luck. Every year at the end of December people in this small Peruvian village fist fight to settle their differences. They then start the year off on a clean slate. In Switzerland they celebrate the New Year by dropping ice cream on the floor. In some parts of Puerto Rico they throw pails of water out of their windows to drive away evil spirits. In Belgium they take their livestock seriously. At least seriously enough that the farmers wish their cows a happy new year! The French like to keep things simple and delicious. Every new year they consume a stack of pancakes. In Colombia they carry their suitcases around with them all day in hopes of having a travel filled year. In Denmark people climb on top of chairs and literally “jump” into the New Year to bring good luck. Besides throwing buckets of water on each other in Thailand they also go around smearing each other with grey talc. In Chile families spend the night in the company of their deceased loved ones by sleeping at the cemetery. Just like in Belgium, Romanian farmers try to communicate with their cows. If they succeed, however, then it means bad luck for the year. In Finland people predict the coming year by casting molten tin into a bucket of water and interpreting the resulting shape. In Scotland the first person to cross the threshold of a home in the new year should carry a gift for good luck. In Estonia people eat seven times on new years day to ensure abundance in the new year. The name Kwanzaa comes from the phrase ‘matunda ya kwanza’ which means ‘first fruits’ in the Swahili language (an Eastern African language spoken in countries including Kenya, Uganda, Tanzania, Mozambique and Zimbabwe). 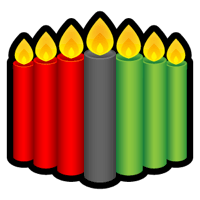 Kwanzaa is mostly celebrated in the USA. During Kwanzaa a special candle holder called a kinara is used. A kinara hold seven candles, three red ones on the left, three green ones on the right with a black candle in the centre. Each night during Kwanzaa a candle is lit. The black, centre, candle is lit first and the it alternates between the red and green candles stating with the ones on the outside and moving inwards. This is quite similar to the lighting of the menorah in the Jewish Festival of Lights, Hanukkah. Mkeka: The Mat – A woven mat made of fabric, raffia, or paper. The other symbols are placed on the Mkeka. It symbolises experiences and foundations. Kikombe cha Umoja: The Unity Cup – Represents family and community. It is filled with water, fruit juice or wine. A little is poured out to remember the ancestors. The cup is share between people and each person takes a sip. Mazao: The Crops – Fruit and vegetables from the harvest. These normally includes bananas, mangoes, peaches, plantains, oranges, or other favourites! They are shared out. Muhindi: The Corn – There is one ear of corn of each child in the family. If there are no children in the family, then one ear is used to represent the children in the community. It represents the future and the Navtive Americans. Zawadi: Gifts – Gifts given to children during Kwanzaa are normally educational, such as a book, dvd or game. There’s also a gift reminding them of their African heritage. The Kwanzaa festival was created by Dr. Maulana Karenga in 1966. Dr. Karenga wanted a way bring African Americans together and remember their black culture. Harvest or ‘first fruit’ festivals are celebrated all over Africa. These were celebrations when people would come together and celebrate and give thanks for the good things in their lives and communities. About 200 BC Israel was a state in the Seleucid Empire (an empire ruled under Greek law) and under the overall charge of the King of Syria. However, they could follow their own religion and its practises. In 171 BC, There was a new King called Antiochus IV, who also called himself Antiochus Epiphanes which means ‘Antiochus the visible god’. Antiochus wanted all the empire to follow Greek ways of life and the Greek religion with all its gods. Some of the Jews wanted to be more Greek, but most wanted to stay Jewish. The brother of the Jewish high priest wanted to be more Greek, so he bribed Antiochus so he would be come the new High Priest instead of his brother and then he had his brother killed! Three years later another man bribed Antiochus even more to let him become the High Priest! To pay his bribe he stole some of the objects made of gold that were used in the Jewish Temple. On his way home from having to retreat from a battle, Antiochus stopped in Jerusalem and he let out all his anger on the city and the Jewish people. He ordered houses to be burned down and tens of thousands of Jews were killed or put into slavery. Antiochus then went to attack the Jewish Temple, the most important building in Israel to Jews. The Syrian soldiers took all the treasures out of the temple and on 15 Kislev 168 BC Antiochus put up a status of the Greek god Zeus in the centre of the Jewish Temple (but it had the face of Antiochus!). Then on 25 Kislev he desecrated the most holy place in the temple and destroyed the Jewish holy scrolls. It began when a ‘former’ Jewish Priest, called Mattathias, was forced to make an offering to Zeus in his village. He refused to do so and killed a Syrian Soldier! Mattathias’s sons joined him and killed the other soldiers in the village. Mattathias was an old man and died soon after this, but his son Judah then took charge of the freedom fighters. Judah’s nickname was ‘Maccabee’ which come from the Hebrew word for hammer. He and his troops lived in caves and fought an undercover war for three years. They then met the Syrians in open battle and defeated them. When they got back to Jerusalem, the Temple was in ruins and the statue of Zeus/Antiochus was still standing. They cleaned the Temple. They rebuilt the Jewish altar and on 25 Kislev 165 BC, exactly three years after the statue was put up, the altar and Temple was rededicated to God. Hanukkah is the Jewish Festival of Lights and it remembers the rededication of the second Jewish Temple in Jerusalem. This happened in the 160s BC (before Jesus was born). (Hanukkah is the Jewish word for ‘dedication’.) 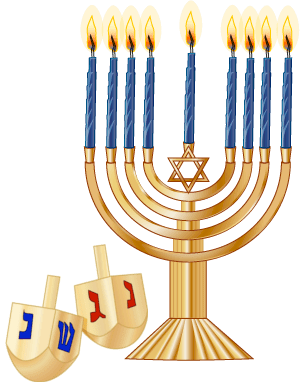 Hanukkah last for eight days and starts on the 25th of Kislev, the month in the Jewish calendar that occurs at about the same time as December. Because the Jewish calendar is lunar (it uses the moon for its dates), Kislev can happen from late November to late December. In 2014, Hanukkah is from in the evening of Tuesday, 16th December until the evening of Wednesday, 24th December. In 2015, Hanukkah is from in the evening of Sunday, 6th December until the evening of Monday, 14th December. During Hanukkah, on each of the eight nights, a candle is lit in a special menorah (candelabra) called a ‘hanukkiyah’. There is a special ninth candle called the ‘shammash’ or servant candle which is used to light the other candles. The shammash is often in the centre of the other candles and has a higher position. On the first night one candle is lit, on the second night, two are lit until all are lit on the eighth and final night of the festival. Traditionally they are lit from left to right. A special blessing, thanking God, is said before or after lighting the candles and a special Jewish hymn is often sung. The menorah is put in the front window of houses so people passing can see the lights and remember the story of Hanukkah. Most Jewish family and households have a special menorah and celebrate Hanukkah. Hanukkah is also a time for giving and receiving presents and gifts are often given on each night. Lots of games are played during the time of Hanukkah. The most popular is ‘dreidel’ (Yiddish) or ‘sivivon’ (Hebrew). It’s a four sided top with a Hebrew letter on each side. The four letter are the first letter of the phrase ‘Nes Gadol Hayah Sham’ which means ‘A great miracle happened there’ (in Israel, ‘there’ is changed to ‘here’ so it’s ‘Nes Gadol Hayah Po’). Player put a coin, nut or chocolate coin in a pot and the top is spun. In the letter ‘nun’ (נ) come up nothing happens, if it’s ‘gimel’ (ג) the player wins the pot, if it’s ‘hay’ (ה) you win half the pot and if it’s ‘shin’ (for ‘there’ ש) or ‘pe’ (for ‘here’ פ) you have to put another item into the pot and the next person has a spin! Boxing day is a Great Australian tradition at Christmas time. Boxing Day is the day after Christmas day. It’s a commemoration day that we inherited from the British for a reason we have forgotten about and never cared about anyway. It’s a big day out. It’s always a public holiday and always much cherished. It is a sports day, but we don’t fight. Two great Australian sporting traditions always capture us on Boxing day. The Cricket and the spectacular Sydney to Hobart yacht race. Many families hang around at home on boxing day and snooze whilst they watch these events on the TV, whilst the kids play cricket in the backyard. Others pack up for a picnic or a trip to the beach. There is always boating and fishing, also great family outings. An extract from a poem, “Tangmalangmaloo” by John O’Brien, perhaps captures the way many Australians feel about Boxing day. The poem describes the day the bishop called in at an outback school and questioned the class about religion. Merry Christmas everyone, yes I know most of my posts lately have been about Christmas traditions but since it is Christmas Day I thought I would end the day by telling you a bit about how I spent the day. Well I was woken up around 7am by Blain, no he didn’t spend last night here but he and Tasha turned up early to give us their presents and to receive our presents to them. Blain went in and woke up Leo and Jessica and Papa as well, so there was a big exchange of gifts here, yes Jessica and Leo spent last night here so Leo was super excited to see that his Christmas bag had been filled by Santa. It was great to see Leo get so excited by all his gifts although Blain was in a mood going one about Leo’s presents and when his mum told him to stop he got all moo dy. Blain has never been one to get excited about Christmas presents or about birthday presents he is just like his mum in that regard but let’s move onto something more important, how I spent the rest of the day. Well I sliced the tomatoes ok more to the point I made a mess of them my slicer first sliced them too thin so I swapped slicers and the second on just tore them apart and I also sliced the cucumber which turned out well. By 9.30am Tim and I headed over to my parents place where we had another exchange of gifts between family members. Then it was time to start cooking the roast potatoes we only do the frozen ones in the air fryer, I had cooked the potato bake last night and had it warming in the oven since I arrived. After lunch we pack up the car and head home again, mum & dad love having all the family around Christmas morning but by 2pm they are glad to see the back of us as everyone leaves and they have a quiet afternoon. Being Christmas Day I have had a number of drinks, ok I am a bit tipsy but what the hell it isn’t like I drink a lot. I will write more about my gifts over the next few days. 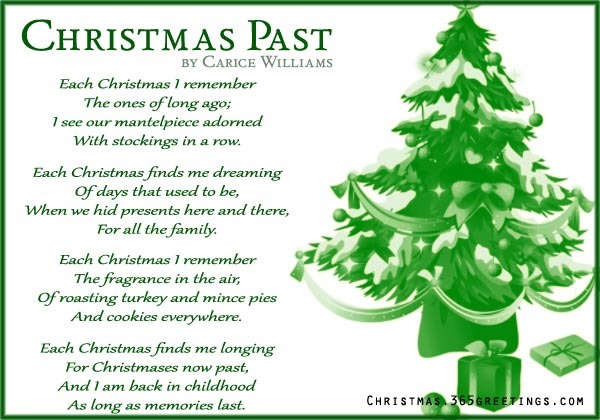 I hope everyone of my blogging friends as well as my family have had a bloody wonderful Christmas or in some cases have a wonderful Christmas as I know not all my friends are in the same timeline as me.